Bangalore: The Bharatiya Janata Party (BJP) on Saturday led protests in Karnataka to oppose the government-sponsored celebrations for the birth anniversary of the controversial 18th century ruler of erstwhile Mysore kingdom, Tipu Sultan. Various groups, opposed to the celebrations, took out a procession in Kodagu district’s Madikeri town. Security was tightened as a shutdown was also called in by various organisations, including the BJP and the Codava National Council. 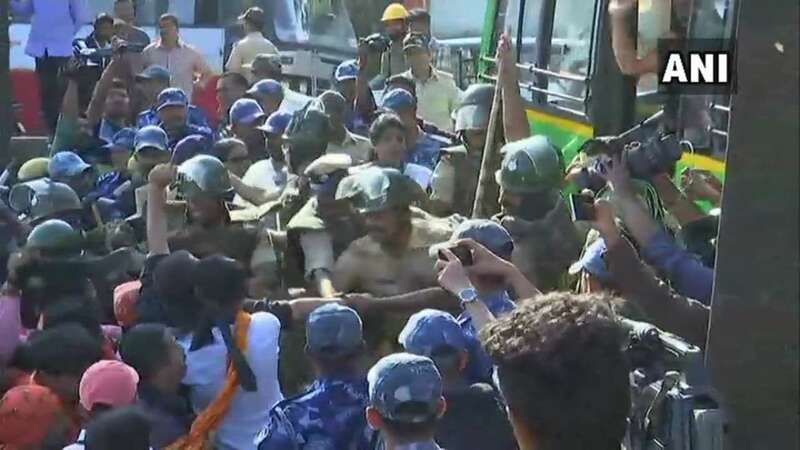 Madikeri became the centre of the protests as BJP workers stormed the Deputy Commissioner’s office protesting against Tipu Jayanti celebrations. They raised slogans against the Karnataka government and the administration. Karnataka: Various groups protesting against #TipuJayanti celebrations in Madikeri detained by police. “Government is wasting public money in the name of Tipu Jayanti. Tipu is not a warrior, he killed so many Hindus and attacked temples. Why are they glorifying a man like him? This is only vote bank politics. Everyone in Kodagu is opposing the celebrations,” BJP Kodagu District Secretary Sajjal Krishnan told ANI. The party had also staged demonstrations at several places including Bengaluru, Mysuru and Kodagu, in the state on Friday. On the advice of doctors, the chief minister will take three days rest till November 11. He will spend time with family on these days and there will be no official engagements on these days, it said. Minister for Minority Welfare, Haj and Wakf BZ Zameer Ahmed Khan said the chief minister had told officials before hand that he would be away for medical check-up and hence, his name should not be mentioned in the invitation. Khan met former Chief Minister Siddaramaiah at his residence in Bengaluru to greet him on the occasion. BJP leaders who took part in the agitation on Friday accused the state government of “hurting” the sentiments of Hindus only to appease Muslims. They said Tipu was accused of killing thousands of people in Kodagu and Mandyam Iyengars of Melukote near Mysuru. Tipu was a tyrant and a religious fanatic. Those who tried to exalt him suffered huge losses, BJP MP Pratap Simha claimed. The BJP also took a dig at Kumaraswamy’s absence in the event. Party spokesperson S Prakash quipped that the chief minister was avoiding taking part in Tipu Jayanti.